Nor Cal Food Solutions of Auburn, Calif., is recalling 567 cases of Purveyors Kitchen – Pumpkin Pesto Tapenade. The product contains walnuts, an allergen not declared on the label. There has been one reported allergic reaction to date. The recalled product was made by Foodie Tout, doing business as Purveyors Kitchen. Nor Cal Food operates a facility previously owned by Foodie Tout, which filed for bankruptcy on February 14th, 2018, and is no longer in operation. 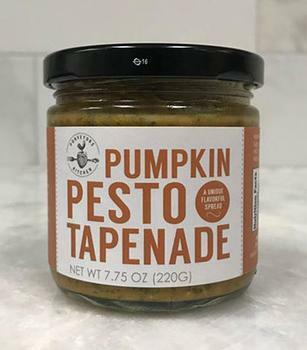 Purveyors Kitchen – Pumpkin Pesto Tapenade is a light brown / orange color with pieces of basil and walnuts in it, and comes in 7.75-oz. glass jars with a black metal lid. The lot codes being recalled are PKPP17179A, PKPP17179B and PKPP17179C, with the expiration dates of June 2019 and PKPP17230B with the expiration date of August 2019. The recalled product was distributed at Purveyors Pantry in Nevada City, Calif., Cost Plus - World Market in Stockton, Calif., and Windsor, Va., from July through November 2017 and sold through retail stores. Consumers who purchased the recalled product should return it to the place of purchase or dispose of it. Consumers with questions may contact the company at (530) 823-8527, Monday through Friday, 8am – 4:30pm or by email at norcalfoodsolutions@gmail.com.